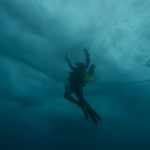 This laboratory has state-of-the-art research facilities, an aquarium and a dive facility complete with recompression chamber as well as offices and a library. 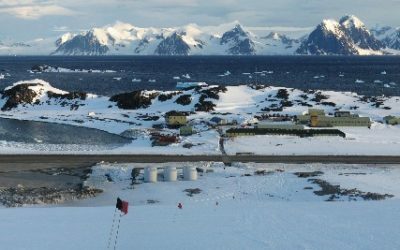 During the Antarctic summer research teams from British Antarctic Survey, UK universities and international partners use the lab. 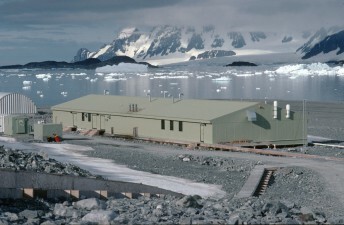 The Bonner Laboratory, opened austral summer 1996–97, with its incorporated dive facility, provides an excellent centre for the study of marine and terrestrial biology.The dive programme continues year round with divers accessing the water through holes cut in the sea ice during the winter. 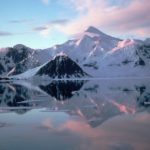 Marine science projects supported by scientific diving at Rothera fall into two categories, those associated with the long-term monitoring of the environment and specific shorter term studies. 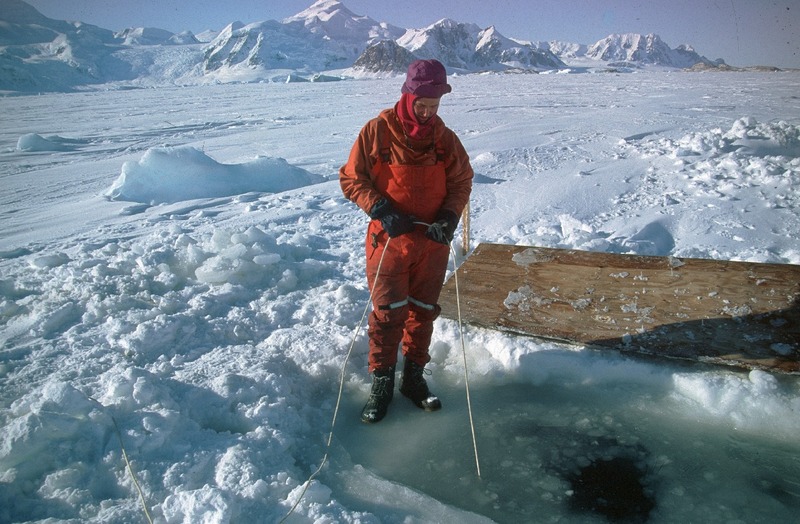 Sedimentation of material is measured with a sediment trap approximately 100 m to the south west of Trolval Island. The trap consists of eight collection pots each of 10 cm diameter held in a durapipe frame at 20 m depth, suspended above a 40 m depth seabed. 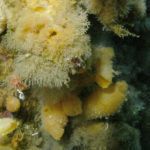 The pots are changed monthly and material caught is used to identify organic and chlorophyll deposition to the seabed as well as being used for analysis for biomarkers and direct identification via microscopic analysis. 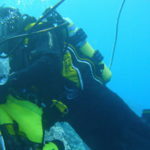 The diving is complex, with several divers removing and replacing pots and cleaning the rig. 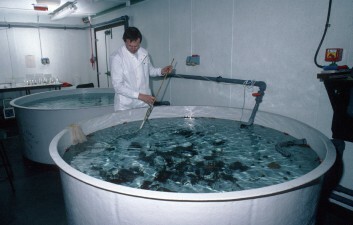 Feeding activity is monitored in a range of sessile filter feeders by direct observation of feeding structures. 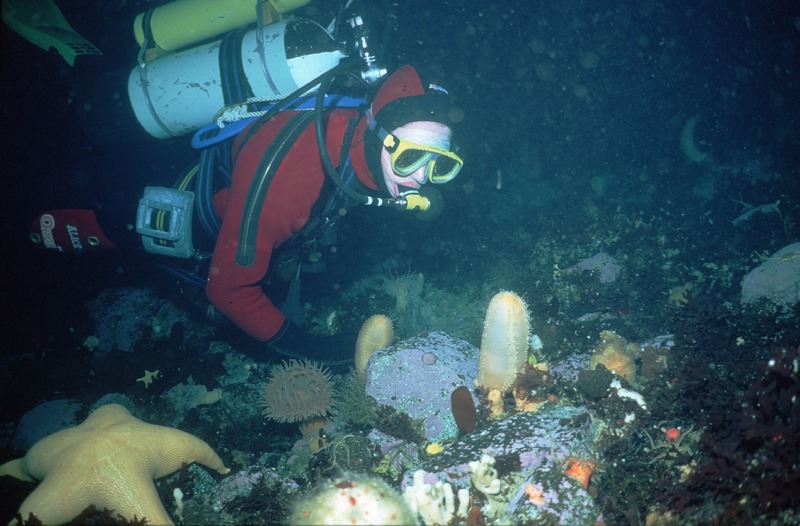 Typical organisms in the study are anemones, sea cucumbers, terrebellid worms, bryozoa, hydroids and soft corals. Divers return to the same individuals or colonies at monthly intervals and note the status of their feeding activity. Two main sites are used, and 15 species are observed. This work requires detailed knowledge of many species, and their taxonomy. 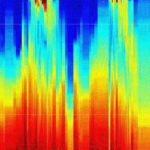 Reproductive monitoring involves the collection of monthly samples for analysis of gonad status in the UK. 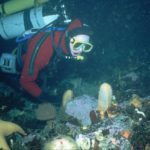 The bivalve Laternula, the brittle star Ophionotus, the nemertean Parbolasia, the limpet Nacella, the starfish Odontaster and Terebellid polychaete worms are all part of this study, and involve diving in different areas. 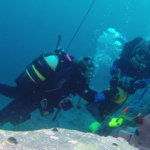 The bivalve Laternula has to be dug by hand from clay sediments at depths of 10-30 m.
Measurements of growth rates in snails and urchins have involved collection and return to the laboratory of specimens by divers. These specimens are then measured, weighed and tagged before returning them to their sites of collection. Some of the tags used are electronic PIT tags either glued to shells or injected into body cavities. 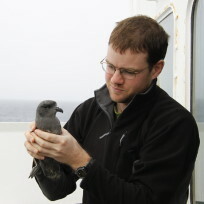 Tagged specimens are collected again at later dates for seasonal assessments of growth. 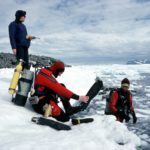 In excess of this, amongst many other projects, we have work using heartbeat monitors attached to limpets in the sea, deployments of Fyke nets for catching fish, and attempts to lay out arrays of markers to measure the extent of physical disturbance by ice.  Diving science projects at Rothera are varied and demanding and are at the cutting edge of polar marine biology. 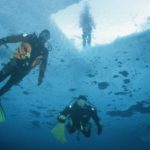 Divers under newly formed fast ice. 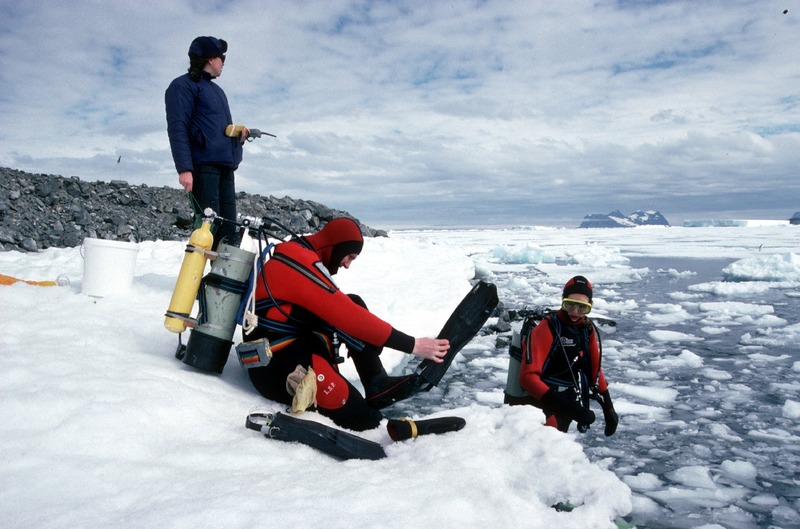 Diver (Alice Chapman) inspecting benthic community 20m under sea ice near Rothera in winter 1997. 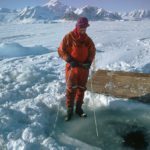 Linesman (Stuart Wallace) monitoring life line for divers working under one metre thick fast ice winter 1997. 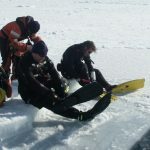 Divers kitting up on the shore prior to commencing a dive. 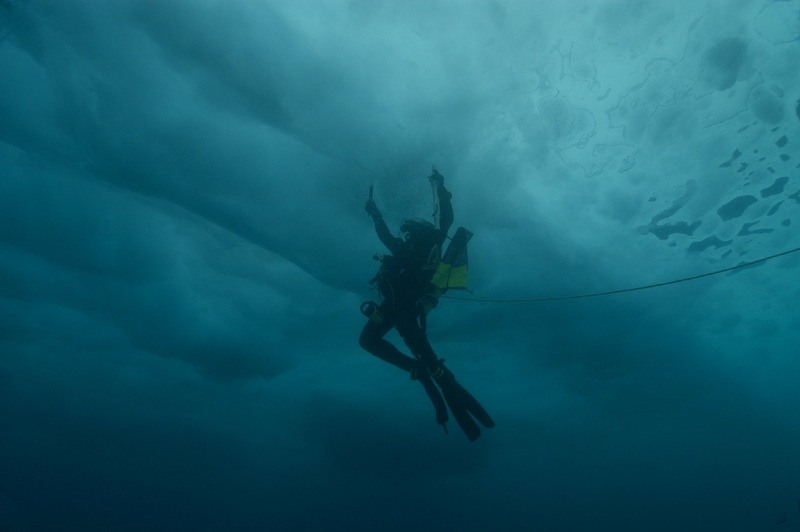 One member of the dive team always remains on the shore to provide assistance to the pair in the water if necessary. Here Sara Lawrence is the safety officer, Lloyd Peck and Alice Chapman will spend about 20 minutes in the water visiting study sites along the shore line. 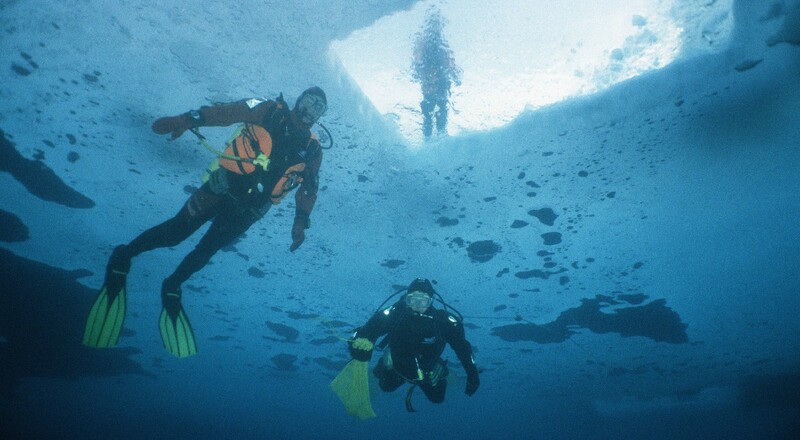 Diver under ice in Hangar Cove. 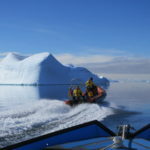 Near Rothera Research Station. 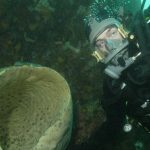 Marine Biologist encounters a giant sponge nearly 20m below the surface. 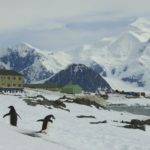 Gigantism may have played a role in the success of some Antarctic marine animals and is one aspect of efforts to understand how evolution has responded to climate change in the past. 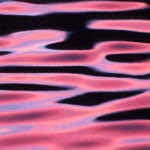 This image is associated with the 2005-2010 BAS science programme: BIOFLAME – Biodiversity, Function, Limits and Adaptation from Molecules to Ecosystems. Andy Miller (Marine Assistant) and standby diver Andy Wilson get help kitting up for a routine biological monitoring dive. 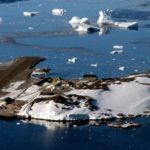 South Cove Rothera Research Station. 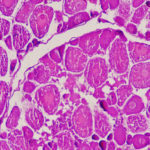 This image is associated with the 2005-2010 BAS science programme: BIOFLAME – Biodiversity, Function, Limits and Adaptation from Molecules to Ecosystems and Long Term Monitoring and Survey (LTMS) programme.